Google (S GOOG) is working on yet another platform for the living room, and it doesn’t just want to compete on looks alone: The company has come up with a novel way to develop TV apps and make use of their data. It’s all part of Google’s goal to unlock the information in apps — but it may not be what content providers actually want. 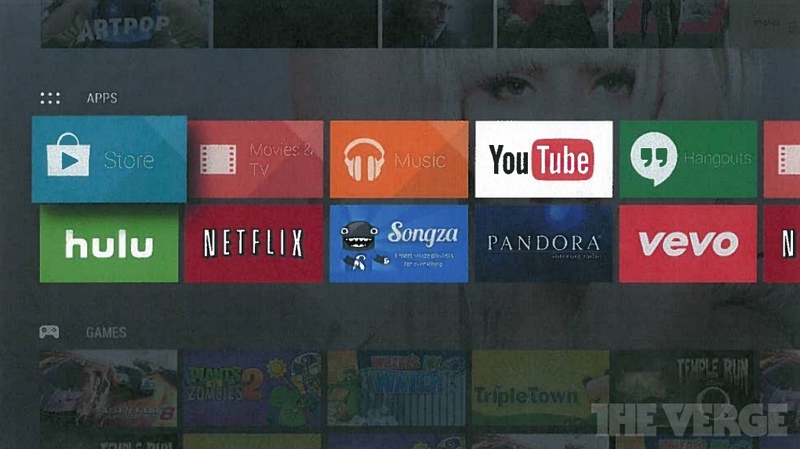 Google’s Android TV project, courtesy of the Verge. There are still a lot of unknowns about the project, which resurfaced after Google killed plans to launch a dedicated box in December. But the information published by the Verge is consistent with things that I’ve been hearing, and it points to a pretty bold departure from the way the company’s failed Google TV platform worked. To understand Google’s new take on smart TVs, it’s worth considering how consumers experience apps on smart TVs and connected devices today. On most devices, app makers have autonomy (for the most part) over how their apps look, with the result being that Netflix’s (S NFLX) app looks very different from YouTube’s, and the Hulu Plus app only bears some vague resemblance to the HBO Go app. I’ve been told that Google’s new approach wants to do away with those differences by replacing these custom interfaces with standardized templates. Publishers wouldn’t need to come up with their own user interface, but instead would develop apps that provide data feeds to the Android TV platform. For example, these feeds would consist of movie titles and box cover art, which would then be rendered by the platform to a more consistent presentation. To a consumer, browsing the catalog of one provider would look and feel more like browsing a directory in a bigger content catalog, as opposed to opening an app that’s completely separate from every other app on the platform. There are some obvious usability advantages to that approach, as it would for example allow consumers to use a remote control in the same way within each app, and expect each app to behave the same way. Deploying new features to each app would also be easier. But the biggest advantage is that it gives Google access to information about the content offered within each app. Google has long pushed to break open apps and make their content searchable. The company recently introduced in-app search for Android, giving consumers a way to find content from apps installed on their phone through mobile search, and this new app model would help to build smarter universal search for the TV as well. 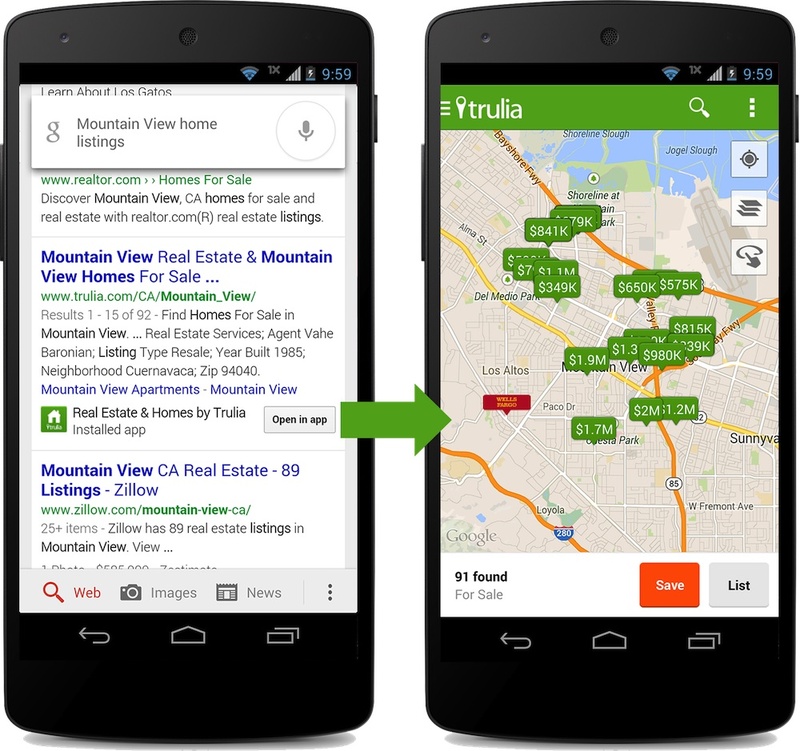 Google’s in-app search for mobile apps. But it goes even further, because it exposes data in a structured way: Not only does the platform know the title of each and every video offered through any app that it receives data from, it also knows which content category a video is placed in, and even which episodes of a TV show are part of the same season. All of that information can help Google to build smarter universal search features, and even pull content out of the app context and present it right on the home screen, or cross-reference content to make smart recommendations. Previously, app publishers would try to solve content recommendation themselves, but this new model would enable Google to suggest content from Hulu Plus after a viewer watched certain shows on Netflix, for example. The question is: do content providers actually want this? Big video services like Netflix and others have spent a lot of money on building out their own content recommendation algorithms as well as user interfaces, and some may question what they actually stand to gain by replacing this with a Google-built template that makes their apps look like everyone else’s. I have heard that Google has been trying to address these concerns by allowing publishers to instead switch to their own native app experience, or even combine the two approaches and list their content in a Google-provided template while still giving consumers a way to open the full app. I’ve also been told that smaller publishers as well as publishers who sell transactional downloads could be a lot more open to Google’s approach, while at least some of the subscription services may instead insist on using their own interfaces. Google wouldn’t launch a product without participation from big names like Netflix and Hulu, which could mean that the company would in the end have to make compromises, with the resulting product looking and functioning a lot more like existing devices from companies like Apple, Roku and Amazon. Speaking about going to market: Google’s TV efforts have undergone many transitions, starting with the failed Google TV platform to the surprise success of the Chromecast streaming dongle. During that process, some products were developed that never saw the light of day. Right now, all evidence points to Google reintroducing an Android-based TV platform at its Google I/O developer conference in June, but it wouldn’t be the first time that the company changed course last-minute. With that in mind, it’s best to consider Google’s new approach towards apps for the TV as a work in progress — but at least it is progress, and an effort to do things differently. A Google spokesperson declined to comment when contacted for this story. How does this article never mention Apple TV which is effectively doing exactly the same thing? Apps/channels have a fairly limited and consistent UX. In fact it’s simple HTML technology behind it (this is how PlexConnect was able to takeover a channel on a non-jailbroken Apple TV). Apple has been consistent since Apple TV went iOS. meanwhile Google is now on its third iteration of a set top box, simply copying what Apple has been doing since 2010, and somehow this article concludes Google has a new, novel way of putting content on your TV. Google is planning android TV? Seems that market graph of Amazon fire TV wonâ€™t raise at high stakes due to Google as its competitor. However on other-hand sales of Google Chrome-cast will not be affected at all. Planningâ€™s of Google android TV are fantastic- when user-interface is concerned. Hats-off to Goddess-Google! – For its approach in Android TV and honor of salute to your fabulous exploration of Google plans. At the revelation of Amazon Fire TV, I thought to avail myself with Fire TV Set-Top Box but Google has finally changed my mind!! Digital Fitness is moving to the home in a BIG way. It might seem like a oxymoron, but you can now participate in group fitness, enabled by Smart TV Apps from the comfort of your own home. Join in on a live group fitness class, find friends, go on quests together, challenge, motivate and support one and other through Smart TV apps. Exergaming is here and is going to radically change how people participate in fitness activities. Another guaranteed Fail for Google. Do they really think every content provider in the world will sign up for this? That every TV shipped will have this installed? They’re just dreaming. The future of the TV is not with a preinstalled OS or content ecosystem. It will be a dumb terminal that links wirelessly to your mobile device and streams whatever you want. This makes the most sense cost- and convenience-wise for users. Tomorrow’s TV is not a rich client. It is merely a display accessory. I just hope they are able to filter the ad-supported programming from the ad-free programming if they want to make providers interchangeable. Well I hope Google isn’t spending too much time and money trying to fix TV with a physical remote. I’m pretty sure we’ve basically topped out what can be done with that. Meanwhile, there is still a lot of work to be done improving the casting interface. Your article begs the question: why hasn’t Google integrated video apps into Google Now? Right now, when I type in “The Avengers” no app links pop up. If I speak “Watch The Avengers” a link pops up for Google Play. Considering Google is integrating links into other types of apps, why the hell haven’t they added Netflix, Hulu Plus, HBO, etc? This would be a killer feature for the Chromecast. I have trouble believing these companies would not want direct links to the movie/show in Google search results. Universal search works on the Roku, so it has been done before. Google Now could also alert me that a new episode of a show I’m watching has just been added to Hulu Plus or HBO with a direct link. Heck, the command “Play the latest episode of Scandal on Hulu Plus on the Chromecast” should be completely achievable with a little cooperation. Google controls Android. They should be leveraging that advantage to crush all other competitors in the living room, not focusing too much energy on a “me too” STB. No one other than Apple is in a position to compete, and Apple is pretty much doomed to fail. They are going to keep coming out with “premium” STBs and completely miss the boat on the low-cost dongle future. As for the whole “template” thing, I’m pretty sure the genie has already been let out of the bottle. Maybe someday a company will become powerful enough to enforce extreme uniformity (Apple may still have this power) but it’s a buyer’s market for device support. If Google’s terms don’t appeal to a network they aren’t going to bother. I just read this article and I thought it was hilarious and spot on. It mirrors my opinion right down to the idea that Apple can’t win the living room because it will refuse to produce the low-cost dongle necessary to do so (even though it should). Google should be doubling down on the Chromecast interface. No other company has the advantages necessary to really pull it off, or more importantly, to WANT to pull it off. Amazon and Microsoft could come out with a Chromecast clone, but since they don’t have a lot of mobile market share, they’d still be handing over control to Google and Apple in the long run. All of the content providers you listed Are using the Chromecast. Buy one for $35 bucks and you’ll see. It took HBO 3 weeks from their announcement to support Chromecast to the publishing of their app. Many others have joined since, again, including Netflix and Hulu+. You do realize that it doesn’t have any web browsing capabilities? There is a concerted effort to disallow the living room monitor being used for anything outside of a controlled ecosystem. I can design responsive web sites for HDTV using SVG technology, but you can’t view them. Sad….. This and the NSAoogle tracking what is served via the platform creates a giant red flag for me and limits what I want to do with a centralized system. Apps are not the end all be all thank you very much. James, I concluded that the viewing distance in the TV experience make it unsuitable for a browser. Of course you can scale the font size, etc.. but most website are simply not that useful when view on large screen TV. Is your experience different? You Can mirror the Chrome Browser through the Chromecast dongle.